The EX600 is designed for professional outdoor shooting. It features fast recycling time, less than 2.5s under full power (600WS). Clear digital screen shows 9 steps precise output controlled by CPU. The change of aperture is less than 0.1 when the exposure photometer is set at 1/60s and 1/500s. 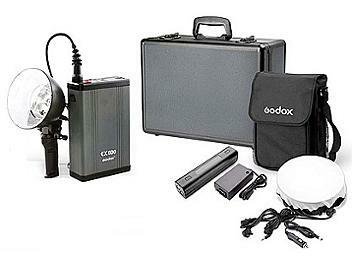 More than 180 times flashes with full power (600WS). Battery recharging is safe and stable, which can be done by vehicle cigarette lighter. This flash is designed specially with unique functions, lightweight to carry, safety to use and powerful enough to support your capture shooting and outdoor photography. It adopts PIC clutch controller design. The internal clutch will cut automatically and the internal circuitry will stop simultaneous when the lamp holder is drawn out of the output socket. Thus, it obtains very good safety effect. There is an efficient internal temperature-controlling (TC) system of the battery. When the temperature is beyond 45oC, the TC system will make the battery stop working until the temperature lows down. There are three ways to trigger the lamp. - One is using a SYNC cord connect with the lamp which can control directly and synchronously. There is a test button on the lamp that you can know whether connected or not. - Another way is light control, while the flashgun is working, the optical receiver in the lamp will receive it and control the lamp synchronously. - A wireless remote trigger kit is also included in the package, plug the receiver into the SYNC socket and set the transmitter on to the camera, then the flash also can be triggered. 1 stands for the minimum power, 9 for the maximum power, and so forth. There are 9 steps of flash output. E: If keep low battery for 10 seconds, E appears for the reason that battery is used up, or that battery or battery pack is overheated and protected by software. If caused by the latter, please turn off the power and stop to use in 10-20 minutes. The installation is easy, just following the installation flash's steps.